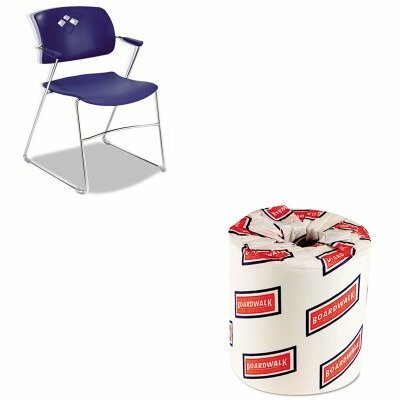 lt;stronggt;SAF4286BUlt;/stronggt;lt;BR/gt;Safco Veer Series Stacking Chair With Armslt;BR/gt;Make fluid movements that result in superior comfort and adaptability across your workspace. Back arches with the natural curves of your body to give relaxing support whether you need an extra seat for a meeting or a roomful for a presentation. Non-marring floor glides. Stack up to 12 high on the floor and 28 high on a cart. Recommended Applications: Conference, Training amp;amp; Meeting Guest, Reception, Waiting Room amp;amp; Lounge Seat/Back Color: Blue.lt;BR/gt;lt;BR/gt;lt;stronggt;BWK6180lt;/stronggt;lt;BR/gt;Safco Veer Series Stacking Chair With Armslt;BR/gt;The economical choice for quality bathroom tissue. Embossed, standard size roll. Tissue Type: Toilet Number of Plies: 2 Number of Sheets: 500 per roll.